Is the Empire’s pathological behavior rooted in Western arrogance and millenarianism dating back to medieval times? Is the current official elite religion of Anti-Religious Religious Fundamentalism (AARF) even more dangerously fanatical than traditional religious fundamentalism? Are Western elites secular humanists or satanists? Is there a meaningful difference between those categories? Why are they willing to risk nuclear war with over 500 million dead to push forward a hopelessly implausible scheme for a one-world empire? What can we do to stop them? These are some of the questions considered in this very stimulating hour of conversation. This show was broadcast on March 21, 2018. This entry was posted on Tuesday, March 20th, 2018 at 7:50 am	and is filed under Anti-War, Education, False Flag/Fake Terror, Freedom, Geopolitics, Kevin Barrett, News, Politics, Protest, Regime Change. You can follow any responses to this entry through the RSS 2.0 feed. This is a great interview that everyone should be forced to listen to. But doesn’t the Saker sound just like Bibi Netanyahu? Strange breed of idiots, No to NWO, these Christian zionists. We don’t have them here, thank God! I don’t know but from where im standing i wouldn’t have any time for these racist idiots. I had islamaphobic neighbours once and moved and then got nice neighbours. Now i just meet nice people who have similar interests. So that’s why i say i’ve no time for the idiots, it’s more fun when there’s a fellowship with the good people to focus on. Yes Hatch, it is a drain. Imagine the amount of energy that Kevin Barret and his friends need battling the evil upon mankind. I am just doing my little bit. We worry about our children and grandchildren so we slog along. They have their genocide program using vaccination and other means. The whole pharma lobby and their medication is designed to kill us. So we are busy with our campaigns, collecting signatures, doing a lot of work battling them and our government where i am. It is astounding the ignorance of the people here in this very educated country with the “best kind of medicine and hospitals”. Imagine that the doctor gave my neighbour something extremely harmful and still trying to defend himself. Please read – the deadly diabetes deception by Thomas Smith. My neighbour is an insulin using diabetic for over 20 years. The insulin he gave her was absolutely no good for her and he gave something else to support it which caused her a great deal of agony. She was going out of her mind. There are horrible side effects of insulin, blindness for one and many others. THere are other ways to combat this sickness. I come from a family of diabetics with my grandfather having his legs amputated so i try my best not to develop this illness. So far so good. Even if were to be diagnosed with diabetes tomorrow, i shall never take insulin. I am off topic. Yeah, i am surrounded by Christian zionists who think that the slaughterers of innocents are God’s chosen. They tell me i am following a satanic religion and to get out of it. I told them to think about why they are uniting together with the people whom Jesus (pbuh) was battling. What a world we live in. Thanks for the inspiration No to NWO. I suppose i feel hippy because im saying it but not doing it! So good to hear some encouragement from you. True, Kevin’s nature is lovely and listening to how he discusses and debates such topics with humility is very helpful to hear. Your neighbours sound like pains. It’s the educated ones that are usually the bigger idiots (think Kevin has an expression for them, cant remember what it is but it’s funny). I used to have problems with people like that. I remember thinking about things like Christianity having had an anti-Islamic element in it’s psychology for hundreds of years (and therefore felt in the group-mind of Christians). Plus there’s the old ‘colonialist rancor’, maybe still existing in a diluted way perhaps, among many pro-western types? (That was supposed to have been based on an unconscious jealousy of superior traditional cultures). Anyway, i think (Western) Christians might be the ones mostly affected by the Islamaphobic propaganda -that’s what i’ve seen in my personal experience anyway. But what a drain, i wouldnt have patience for neighbours like that. My in-laws are nice people, but unfortunately they also happen to be largely pro-western brainwashed people like your neighbours. Maybe you’ll have some luck explaining things to them, but i know i wouldn’t bother. People like that are too arrogant to listen, too ignorant to even fathom anything of the different assumptions your views of the world are based on and too stubborn to want to know anything different. I wonder if they put their identity (or something?) on top of truth. I am always agreeing with Hatch and Maisoon. It feels like our hearts function the same way. I may have my misgivings with The Saker but i shall not mention why. Of course, Kevin Barret is a saint. His quest for the truth and his courage is deeply appreciated. Sometimes i think he is too good natured and diplomatic that he does not want to upset his guest even when his guest is wrong. Good-naturedness is a virtue in my book. Yes, i agree with the last point that The Saker said. You do not sound like a hippy Hatch, this is what i am trying to do everyday and i am not a hippie. Back in the old days, maybe, but i have gotten old/older and i have changed quite a bit. It is not that easy working on ourselves, we definitely need God and our prayers. I need God and my prayers to keep my feet on the ground. Islam is the perfect way for me. I reverted to Islam in 2005, you know, it was because of 911. I studied the matter and put 2 and 2 together. Unfortunately my Christian neighbours do not want to know anything about Islam. They see Islam as the enemy. These are educated people. I tell them over and over again that usrahell did 911. I told them where i am concerned the original version of Christianity and the original version of Islam is the same religion. We should study the matter properly and find out who our enemy is and unite. They thought i was mad. Recently, our lady neighbour got so ill because her doctor gave her a wrong medicine. I managed to find out what the problem was and organized some alternative medicine. She was so desperate that she accepted what i brought. She feels better, she now sees that we Muslims are not the murderers of Christians like she always thought. I hope she and i can have a good friendship in the future that i may be able to explain to her about the satanic plan. Maybe she is Christian zionist, i do not know that yet. So it shall be very difficult task. We need to pray for Palestine and for the whole world. We need to pray for our loved ones, even those who have died. This takes a lot of time but it needs to be done. Someday, when i am on my death bed, i shall regret deeply if i do not do this. I have many regrets already. Good point that The Saker made at the end -there’s not much we can do apart from pray for God’s mercy. The existence/presence of you guys is part of God’s mercy. With all due respects to Saker, I totally disagree with his summation that Putin is fighting against the Anglo Zionist Hegemony. Despite having thrown out the Rothschilds, Putin has very close relations with Netanyahu, a Rothschild asset, with Israel militarily and through A.I/Hi technology. He liaised all his attacks in Syria with the Israelis. They are both involved with the One Belt, One Road Programme. Putin’s sponsors were all Zionist Chabad Lubavitch oligarch devotees. As for Trump being an outsider-not part of the Establishment that Clinton perhaps belonged to, that too is not true, as Trump has always been part of The Zionist Deep State Establishment with Jewish Oligarchs as his mentors funders, bailers, and now his controllers [Sheldon Adelson, Kushner,even Soros and of course Netanyahu- bosom pal of both Trump and Putin- both serving the same agenda. Only difference today is there is a ‘family’ feud’. Putin like Trump pose as Nationalists wanting to make their country great but one has to ask at whose expense, over looking the National and Economic political interests and National Security of other nations that they are involved in..
Trump and Putin both serve Israeli/Jewish interests- always have done so. Trump is a weak corrupt Puppet whose strings are pulled by Tel Aviv and the Jewish Lobby groups. Putin may appear stronger leader than Trump, puts Russia’s interests first but he too is part of this evil Masonic Cabal ruling and controlling our world. The Psychopaths[who are in no way elite’ other than in their evil] are just competing and having their family tiffs arguing for a bigger share of the Pie. 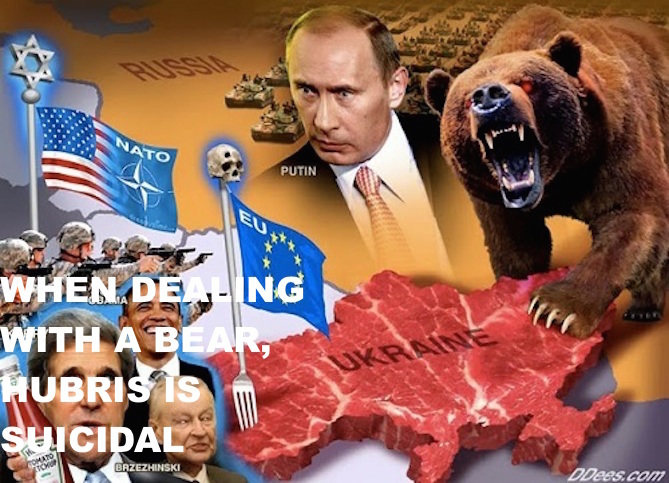 Putin is not the alternative Saviour of our world against the Zionist Imperialist Beast, as analysts like Saker, Roberts, Vltchek and others in the alternative sphere. Saker voice sounds so much like Netanyahu though thankfully he does not share his political ideologies. Does it really have to all fall apart and start over again or can we stop the snowball in the the middle of the hill? We have to come up with answers soon to stop this madness as the Zionist owned MSM is beating the war drum from early morning to late at nite.